Compelling, grounded narratives and examples that intensify and guide longing in the space between what is and what could be energize action. 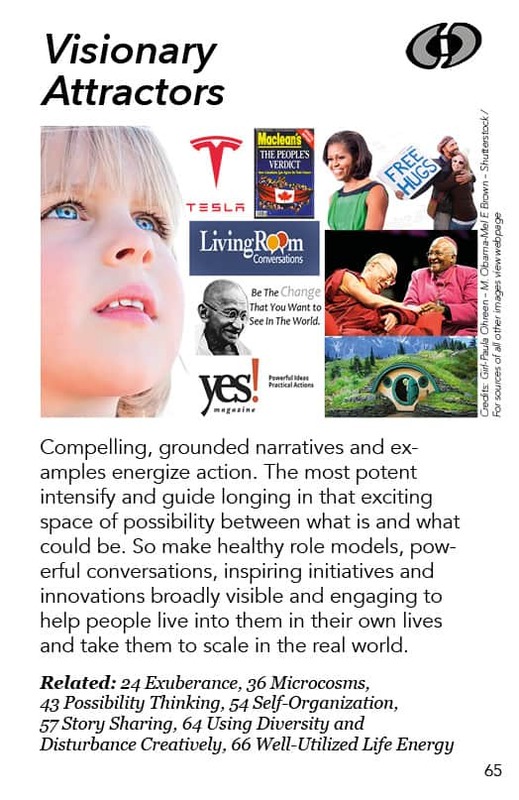 So make healthy role models, powerful conversations, inspiring initiatives and innovations broadly visible and engaging to help people live into them in their own lives and take them to scale in the real world. Visionary attractors are compelling, grounded narratives and examples that intensify longing in the space between what is and what could be and thus energize action. Role models, powerful conversations, inspiring initiatives and innovations – if presented well – can help people live into them in their own lives and take them to scale in the real world. This pattern was actually inspired by Maclean’s magazine, which is a big enough example that I’ll talk about it in my description here. They got a group of a dozen Canadian citizens together in 1991 and had them facilitated by Roger Fisher (co-author of the classic Getting to Yes) and his team from Harvard. The task was to come up with a shared vision for Canada and these people had been chosen for their amazing differences. They were all different and represented different kinds of perspectives, energies and demographics in Canada. So readers and viewers were pulled into the story of what happened. They were drawn into the conversational details which were provided by the coverage, vicariously experiencing the day-by-day, hour-by-hour struggles and breakthroughs that unfolded. So this was a way of magnifying the impact of what happened by inviting millions of people into a different way of having a conversation. Most of the people who were watching or reading this probably never dreamed it was possible for such diverse people to actually work together and create a visionary document together. But they saw it happen before their own eyes. I call this pattern Visionary Attractors because it draws people in to some possibility. A visionary attractor is a kind of thing that we want to have happen that is presented in a way that draws people into trying to have more of it and to do more of it. A familiar example is people who are role models. For example, in the United States we suddenly had a black president. Black people who never dreamed they could ever be president suddenly started thinking, “Wow, I could be president!” There are people who started to get involved in politics because there was a black president. Then you prove that it’s possible and suddenly people get drawn into that possibility. This can also be accomplished with imagination or an imaginary story. There are examples of utopian novels like Walden Two about which people actually said, “Hey, let’s try and do this!” Earth First! is a radical environmental group whose founding was influenced by people who just started doing the things that were described in a novel called The Monkeywrench Gang. It said “here are the things you do, here’s why, and here’s how” – all in the context of a compelling story. Visionary attractors are important for wise democracy in a number of ways. 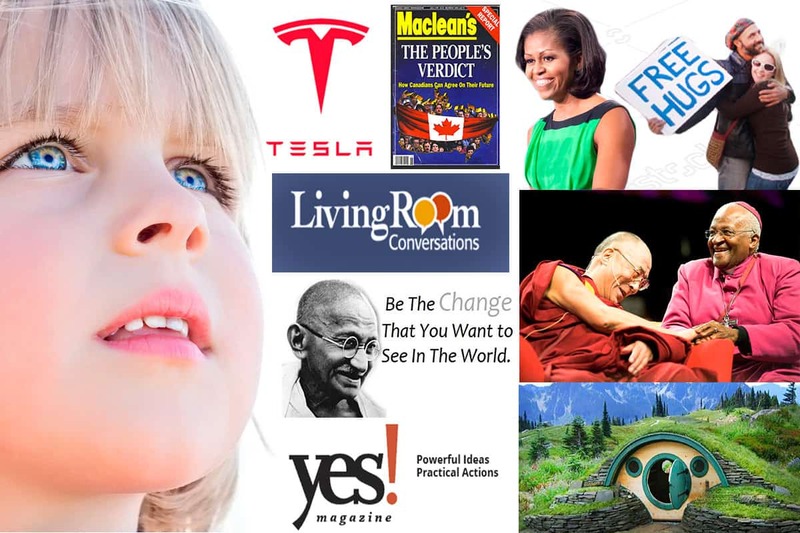 One is their role in helping us get there, to get these wise democracy modes and methods known and presented in ways that people want them the way the Maclean’s magazine did. Another is to imaginatively clarify how wise democracy could operate. For example, there are an awful lot of microcosm activities going on where people are investing informational, facilitation or random selection resources into groups who are paying particular close attention to working on a given issue. You can generate a level of collective wisdom in such a group but then there’s the issue of the relationship between that group and the larger society. The question is how does the larger society participate in, pick up and absorb, work with and digest the wisdom that comes out of such a microcosm. We need visionary attractors – both real and imaginary – to help us think about that. I can imagine if and when visionary attractors are formally embedded into various democratic systems, they can be evocative and can draw people in to explore and learn about the details of a particular situation or public issue. This is different from and not necessarily propagandizing to the public as in the example of soap operas where a particular approach gets promoted into the population using a compelling story. A wise democracy visionary attractor could present multiple viewpoints to help people learn and gain inspiration to get involved and bring actions and solutions into their lives and communities. So the presentation isn’t as important as the thing that is being presented. But the presentation has to ramp up the energies that exist between what we have now and what we’d really like to have. I call this general kind of activity “imagineering”. The materials I have on imagineering on my website give specific examples like the Free Hugs Campaign. This began with a video of a guy in a mall walking around with a sign that said “Free Hugs”. People at the start of the video all ignore him. Then an old woman comes up to hug him and soon other people start joining and pretty soon after that he’s passing out signs that say “Free hugs” and other people start walking around with a “Free Hug” sign getting and giving hugs. Then the video shows the mall guards coming around and saying “No, you can’t do that. It is too risky and somebody is going to get upset.” So then the video shows the free huggers getting signatures on a petition. They get thousands of signatures and present the petition to the guards who then back down, and the free huggers carry on with their hugging activities. This is all covered in a fascinating five minute video – which quickly went viral. So soon we find people starting to do free hug campaigns all over the world. There is a whole free hugs movement with people going around with signs and videoing each other giving and getting free hugs. I looked at that and I thought, “If we could do that really well with social change stories – if we could figure out what we can represent in simple doable ways that are as compelling as the free hugs video – that is what’s needed for the transition that we’re trying to make happen. That’s a very powerful kind of intervention.” That is what imagineering is all about. “Positive Deviance” is another example, albeit a very different application of the visionary attractor pattern. You have a situation like an example that I read about from Vietnam: Very poor children there suffered from malnutrition. A small group of people trained in Positive Deviance went and explored what was going on there. They discovered pockets of places where kids were not malnourished. Further research disclosed that there were little animals growing in the rice paddies where mothers worked and that the mothers would gather and cook those little animals for their kids. So the Positive Deviance folks arranged for these mothers to talk with mothers in the malnourished districts and the practice spread. So we take positive deviants – people who are already doing a successful action regarding an issue or problem shared by their community – and have them go and talk to others who are still wrestling with the problem. Note that it wasn’t some international public service NGO coming in and saying, “Why don’t you feed the kids!” It was rather, “Here’s your peer. This is what she’s doing now.” The peers would then talk about it and arrange to do the successful action. So that’s what spread the idea of feeding these little animals to the kids in Vietnam. These are all radically different approaches in which a possibility is presented in a compelling way that inspires people to actually live into it. Something happens on a small scale and then evolves onto a bigger scale. Gandhi and Rosa Parks are examples of role models. In the bus depot in Eugene, Oregon, where I live, there is a statue of a bus seat with Rosa Parks sitting in it. You can sit down next to Rosa Parks. Pictures of role models can have powerful impact, like the image of a Chinese man with shopping bags standing in front of military tanks in Tiananmen Square, blocking their progress. The picture – taken from far away and high up – has become an archetypal symbol of resistance. Another role model is the young black woman Simone Biles who is a gold medal Olympic gymnast. She is quite famous currently. It is just magical the stuff that she’s doing, things nobody has ever done before, and she is only 19 years old.